Add the Rung Safety Bar to any PRO line model. This flip up handrail attaches to the top of the extra wide rungs on the 36″ wide X-Decks. 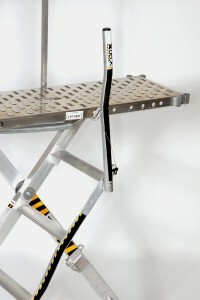 The flip up handrail allows someone an extra place to hold when walking on or off of an X-Deck.